Isn’t it lovely? All tall and regal and electric. I even bought it at Costco, which we all know is the forty-plus crowd’s version of The Mall. I bought one of these last year and–wouldn’t you know it?–one of the kiddos broke it. (Still no word on which kid.) By some apparently unseen force, a stubborn yellow #2 pencil found its way down the blade-lined tunnel and, tragically, never found its way back up again. After much prodding, prying, toil and trial, the pencil eventually broke off at the halfway point, thus canceling all chances for any recovery the poor sharpener may have had. 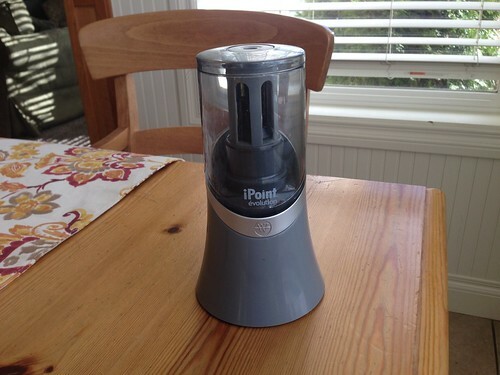 It was a dark day for me, as that iPoint was much more to me than merely a freaking awesome pencil sharpener. That iPoint represented a certain socioeconomic status finally achieved in my life, so ardently sought for so many years. That iPoint was my midlife’s red convertible. And it had, the sake of this discussion, had its tires slashed. 2) I am extremely wealthy. Wait, that came out wrong. Okay, I am extremely well-to-do. (Reference my shopping at Costco; need I say more?) 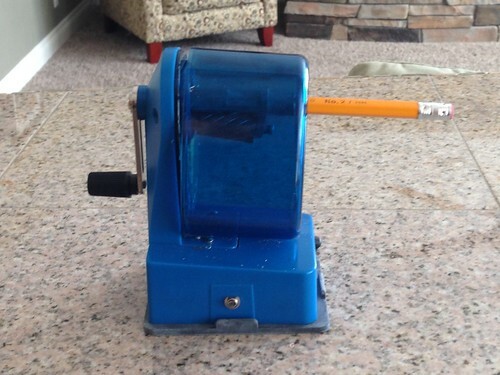 Hence, purchasing a replacement sharpener was really no big thang, thankyouverymuch. 3) I’ve been dying to say thang on this blog for years. It’s so much funner than thing, isn’t it? thus rendering itself useless in helping a teary fifteen-year old finish her math homework last Tuesday night. I was leaving the house to run something to a friend’s house when she stepped in front of me, filling the doorway with the anemic apparatus cupped in both hands. She held it out to me as gently as if she were offering me a palmful of rose petals. Or a hand grenade. “Mom, look.” she announced timidly. (She was aware of this subject’s dark history.) I looked, and I sighed. “You’re kidding.” I was holding it together, you see. She shook her head silently. The good news is that I made up with my daughter as soon as I came home. Because upon entering my dear friend’s house and relating our family’s troubles, what did she have to offer me but this? There’s old school and then there’s old school, and this baby belongs in the latter. 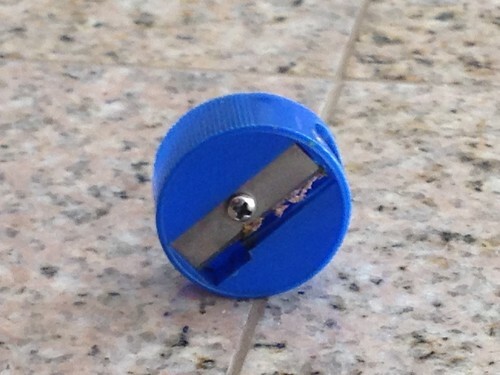 This is the lowest common denominator of pencil sharpeners everywhere, and it was not without some keen satisfaction that I pressed it into my teenager’s (perpetually) outstretched hand. You want a new pencil sharpener, darling? 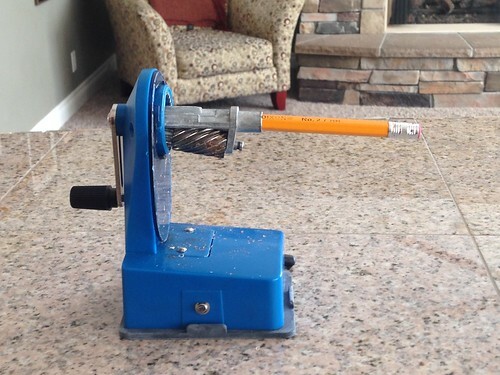 I’ll give ya a new pencil sharpener.